Over 115 years of Service to Our Lord, Community and the World Country Covenant was officially established in 1894 as the Svenska Missions F�rsamling (Swedish Mission Congregation) in Lily Lake . Meetings actually began in 1885 when a small group of Mission Friends in the Chicken Grove area felt the need of getting together for spiritual fellowship. The first service was held in the home of Gustav Lidberg. Miss Sofie Lidberg was able to secure Rev. C. A. Bjork, president of the Svenska Missions to come and hold services. With increased interest in these services, arrangements were made to hold services in the Lily Lake Congregational Church. The Rev. Edward Johnson, a student from Risbergs School in Chicago was called around 1890. Meetings were held from time to time until 1894 when several families voiced their desire to have a church of their own. On July 22, 1894 in the home of Charles P. Dahlstrom a group of Christians gathered for the purpose of organizing a church. Then on August 2 in the home of Gustav Lidberg after reading God's Word and seeking His Guidence, the Svenska Missions F�rsamling in Lily Lake was officially organized. An acre of land was purchased in 1899 for about $135 and almost immediately construction of a frame church was started. Trees were felled on the lot to be used for girders. Stones were gathered from nearby fields, while others were hauled from the South Elgin quarry. Lumber was hauled from Elgin. It was a day's trip with horses and wagon for each load of lumber and stone. As much labor was donated, the actual cost of the church was about $800. The construction on the church began in 1899 with completion and a service of dedication on February 4, 1900. 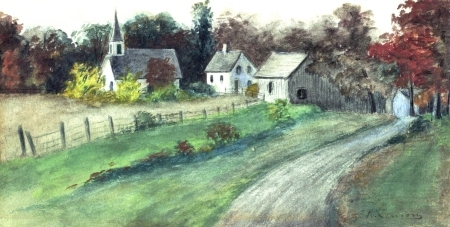 This watercolor by Ruby Lemon (Mrs. Elmer McDonald) was painted around 1900 and is the earliest known image of the church..
On February 4, 1900, the congregation together with their pastor, Rev. C. J. Holm, met together for the dedication of the church. This was a time of rejoicing for the entire Community and thanks was given to God for enabling them to complete the building without debt. In September 1901, the name of the church was changed to Svenska .Missions Forsamling of Plato and services were to be held every Sunday afternoon. Student pastors served the church until in 1911 when Rev. August Johnson together with his bride came to both live and work in the community. He stayed until 1913 and was succeeded by Rev. C. J. Bjork, who served the congregation until 1921. From 1921 until 1948, the church was again served by student pastors. The 25th Anniversary was celebrated in June 1919 by a series of special meetings. Two former pastors, Thure Jacobson and John Westlund were the guest speakers. A fellowship dinner on Sunday, on the John Skoog lawn was attended by 200, including friends from the Elgin and Batavia Covenant Churches. A number of improvements were made during the years. A furnace was installed in 1914 and a basement was added to the church in 1924. Library cases were installed and kerosene lamps were replaced by electric lights in 1937. Finding that seating capacity of the church was inadequate for special occasions and Sunday School classes, it was decided to build a balcony. With great enthusiasm, the men in the church helped in the construction work at a cost of $800. An oil painting, Christ in Gethsemane by Warner Sailman, was presented to the church by Y. P. Society in connection with the balcony dedication, August 3, 1941. In the winter of 1941, an oil burner was installed. 1934 - The 40th Anniversary was celebrated during the week of July 17-22. Festivities include a Fellowship Supper in the Plato High School, a combined English-Swedish service, a Confirmation Reunion, and a Communion Service. Because of intense heat, the concluding Anniversary service was held in the woods east of the church. 1939 - The Swedish language was gradually replaced by the English and now the latter has been used exclusively. 1941 - A great celebration with thanksgiving for 50 years of blessing in the church was held July 19 - 23. Rev. Gordon Nelson, former pastor, and Theodore Anderson, President of the Covenant, were the special speakers. 1943 - The first monies for building a parsonage were received. 1948 - It was possible to proceed building the parsonage and on April 4th a ground breaking ceremony was conducted. On August 22, during open house festivities, the keys to the new parsonage were turned over to its first occupants, the Rev. and Mrs. Edward G. Johnson. 1952 - A memorial Fund made possible the purchase of an electric organ. 1950 - The Communion Table was given by the Dahlstrom - Johnson families. 1954 - A new and larger oil-burning furnace was installed in 1954. 1957 - Marked the installation of stained glassed windows, a new pulpit and pews, oak wainscoting and new doors with glass so that the library could also serve as a Mother's room. 1958 - New light fixtures were installed. 1959 - Our 65th Anniversary was celebrated at various times during the year with former pastors as our speakers. Special services were held during the week of June 21-28. 1961 - A new constitution was adopted. 1962 - The congregation is grateful to Mr. and Mrs. Frank Anderson for the parcel of land, north of the church, donated by them. A building committee was then appointed for preliminary planning in reference to church building plans and future expansion. Several remodeling plans as well as plans for a new church have been dis. cussed, but no decision has been made. 1963 - Six Norway Maples were planted on the church and parsonage property to replace 22 elms stricken with Dutch Elm disease. 1965 - The Baptismal Font were given by the Dahlstrom - Johnson families. 1967 - A bedroom and all purpose room were added to the parsonage basement. The Ladies Aid Society (now Women's Ministries) was started as early as 1890 with Mrs. John Nelson as leader, and organized in 1895. Andrew Carlson and August Nelson were the originators of the First Sunday School in 1895, meeting in the homes. On March 7, 1896 the Sunday School was organized with Nels Nelson as Superintendent. The first Confirmation Class was conducted by Rev. Abel Anderson in 1898-99. The foregoing history is far from complete. Much more could be told about members and friends who have had such an important part in its great work, but time and space will not permit. The memory of our predecessors should be a challenge to us all. They carried the torch of spiritual fire with them from across the sea. Let us keep it burning brightly so we may light the way for our children and our fellowmen around us. Let us remember that it is not the glories of the past that count in the Lord's service. Rather, the all important factor is what we are willing to do now. We face the future with courage because Christ has promised to be with us always even unto the end of the world.